Carpentaria Mt Isa Minerals Province - Mas Mechanical - Mechanical, auto electrical & airconditioning specialist servicing Mount Isa and surrounding regions. The Carpentaria Mount Isa Minerals Province is one of the world’s richest mineral producing regions located in north west Queensland. 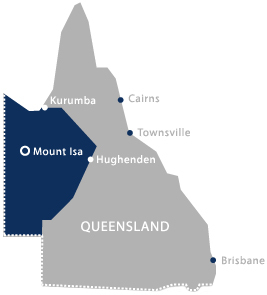 Centred around Mount Isa and Cloncurry, the province extends from the Northern Territory border up to the Gulf of Carpentaria and is home to large mining conglomerates including Xstrata and BHP Billiton. The region contains about 11 per cent of the world’s known lead and zinc reserves, 5 per cent of the world’s silver resources and 1.5 per cent of the world’s copper reserves as well as major phosphate and uranium deposits. The Mount Isa and George Fisher mines have been in operation for more that 80 years are the backbone of region’s production. Recent exploration activity in the province has resulted in the discovery of a number of new deposits and the expansion of existing operations. The availability of new energy sources such as petroleum and geothermal resources is also stimulating interest in the region. With many areas still under-explored, the province continues to demonstrate massive potential for new discoveries ensuring the long-term growth and sustainability of the region.